The decade or two after WW2 saw many of the world’s poorest countries gain their independence from Colonial rule, and they were hoping to rapidly become less poor. Economics taught policy makers in those countries that a higher investment rate is crucial to assuring faster economic growth. Being a poor country makes it harder to finance the required investments from domestic savings. Yet rich countries should have ample savings available that might be profitably diverted to this task. In an ideal world, global capital markets could be expected to bridge the gap. But 70 years ago those markets were thin and/or not trusted as a source of finance. In response, the United Nations Monetary and Financial Conference, held at Bretton Woods in 1944, created the International Bank for Reconstruction and Development (IBRD)—a core component of what came to be known as the World Bank. (The International Monetary Fund was created at the same time.) The essential idea was that the IBRD would borrow money on global markets to lend to developing countries. The Bank’s AAA credit rating (stemming from conservative lending policies relative to its capital) allowed it to lend on favorable terms. An aid-facility (with a large grant component), the International Development Association (IDA), was added in 1960. Much has changed in the 70 years since the famous Bretton Woods conference. World Bank lending (IBRD+IDA) now represents only about 5% of the aggregate private capital flows to developing countries. In the last 10 years or so there have been prominent calls for radically reforming, or even closing, the institution on the grounds that international capital markets have developed greatly over those 70 years. It is also claimed by some that the Bank’s efforts are wasted due to poor governance in developing countries. Does the Bank still have an important role? If so, does it fulfill that role, and if not, how might it do better? In a new paper I argue that the Bank’s development role today overlaps only partially with its original role, as conceived at the Bretton Woods Conference 70 years ago (Ravallion, 2015). Its role today is complementary to (rather than competing with) the private financial sector, other development banks, and academia. Knowledge-generation is central to that role. Development knowledge has properties of a public good, which the Bank can generate in the process of actually doing development on the ground. Threats to the Bank’s effectiveness: There is still much appeal to the bundling of knowledge with lending that has been the distinctive feature of the Bank’s operations. But there are a number of threats to the efficacy of this model. There have been some longstanding concerns that the Bank’s “lending culture” rewards operational staff for the volume of their lending, with only weak incentives for assuring that knowledge is both applied and generated in the lending operations. The pressure to lend influences the Bank’s ability to deliver objective policy advice to client countries, even when it is not welcome politically. Too often the Bank’s “country strategy” essentially mirrors that of the government, which may or may not serve broader long-term development goals. Another threat is the perception that the Bank’s most powerful shareholders have excessive influence on its operations and policy advice. The U.S. has long been identified in this role, though some other countries have also been keen to have their say. Some critics are concerned (rightly or wrongly) about conflicts of interest when the Bank gives advice to developing countries. These are threats to the Bank’s effectiveness as a knowledge leader in both the public and private sectors. All parties—both clients in developing countries and private investors—must have confidence that the institution is not pushing lending for its own sake or beholden to a few powerful owners. Only then can the Bank be accepted as the source of the objective policy advice and information that is needed. Knowledge Bank? There has been much rhetoric about the “Knowledge Bank” over the last 15 years, but I am not alone in believing that the reality has fallen short of the rhetoric. There is a chronic and growing underinvestment in the kind of rigorous research that is needed to identify and address pressing development issues—both the constraints on rapid poverty reduction at country level and the global public bads that threaten us collectively (ranging from climate change to pandemics). Research has been under-valued and under-funded. Granted we still see some high-quality research at the Bank, though not always on high-priority topics. We see more ex-post evaluations today than 20 years ago. However, much does not get evaluated, and what gets evaluated is a non-random subset of all projects, casting doubt on what we learn about the whole. Too often, methodological preferences drive what gets evaluated rather than the knowledge gaps facing policy makers. Alongside this, we see fewer and less rigorous ex ante evaluations, which make explicit a project’s economic rationale—why the project is expected to have a social value justifying its cost. First, the Bank needs to be more ambitious in identifying and addressing the most pressing knowledge gaps we face today. Policy advocacy must give way to well-informed and objective country-specific analysis. This can be accommodated within the Bank’s traditional country-lending model. Second, the Bank’s lending operations must be driven by knowledge of the binding constraints on poverty reduction in specific country contexts and its analytic capabilities must be brought more systematically into its operations from the outset. The Bank’s knowledge generation efforts must inform the nature of its lending and be informed by that lending—rather than simply serving lending when called upon. This requires quite fundamental changes in staff and managerial incentives and resource allocation within the current structure. Third, the Bank’s present country-based model needs to be supplemented by a model with greater capacity for supporting the provision of global public goods. If one was to sit down today to design a mechanism to support the cross-country coordination needed to address shared threats it is unlikely that one would come up with the Bank’s current country-lending model. A new model, or possibly a new institution, is called for. Further reading: Martin Ravallion, “The World Bank: Why it is Still Needed and Why it Still Disappoints,” Journal of Economic Perspectives, Winter 2016. Another type of evaluation deliberately alters the program’s (known or likely) assignment mechanism—who gets the program and who does not—for the purpose of the evaluation. Then the ethical acceptability of the intervention does not imply that the evaluation is ethically acceptable. Call these “ethically contestable evaluations.” The main examples in practice are randomized control trials (RCTs). Scaled-up programs almost never use randomized assignment, so the RCT has a different assignment mechanism, and this may be contested ethically even when the full program is fine. A debate has emerged about the ethical validity of RCTs. This has been brewing for some time but there has been a recent flurry of attention to the issue, stimulated by a New York Times post last week by Casey Mulligan and various comments including an extended reply by Jessica Goldberg. Mulligan essentially dismisses RCTs as ethically unacceptable on the grounds that some of those to which a program is assigned for the purpose of evaluation—the “treatment group”—will almost certainly not need it, or benefit little, while some in the control group will. As an example, he endorses Jeff Sachs’s arguments as to why the Millennium Villages project was not set up as an RCT. Goldberg defends the ethical validity of RCTs against Mulligan’s critique. On the one hand she argues that randomization can be defended as ethically fair given limited resources, while (on the other hand) even if one still objects, the gains from new knowledge can outweigh the objections. Any presumption that an RCT is the only way we can reliably learn. That is plainly not the case, as anyone familiar with the full range of (quantitative and qualitative) tools available for evaluation will know. Any evaluation for which the expected gains from new knowledge cannot reasonably justify an ethically-contestable methodology. The latter situation is clearly objectionable if it is seen to hold. But it is often hard to verify in development settings. Ethics has been much discussed in medical research. In that context, the principle of equipoise requires that there should be no decisive prior case for believing that the treatment has impact sufficient to justify its cost. (This is David McKenzie’s sensible modification to clinical equipoise to fit the types of programs in discussion here.) By this reasoning, only if we are sufficiently ignorant about the likely gains relative to costs should we evaluate further. Implementation of such an ethical principle may not be easy, however. In the context of antipoverty or other public programs, a priori (theoretical and/or empirical) arguments can often be made both for and against believing ex ante that impact is likely. A clever researcher can often create a convincing straw man to suggest that some form of equipoise holds and that the evaluation is worth doing. While this cannot be prevented, we should at least demand that the case is made, and it stands up to scholarly public scrutiny. That is clearly not the norm at present. It has often been argued that whenever rationing is required—when there is not enough money to cover everyone—randomized assignment is a fair solution. (Goldberg makes this claim, though I have heard it often. Indeed, I have made this argument a few times with government counterparts in attempting to convince them on the merits of randomization.) In practice, this is clearly not the main reason that randomistas randomize. But should it convince the un-believers? It can be accepted when information is very poor, or allocative processes are skewed against those in need. In some development applications we may know very little ex ante about how best to assign participation to maximize impact. But when alternative allocations are feasible (and if randomization is possible then that condition is evidently met) and one does have information about who is likely to benefit, then surely it is fairer to use that information, and not randomize, at least unconditionally. Conditional randomization can help relieve ethically concerns. One first selects eligible types of participants based on prior knowledge about likely gains, and only then randomly assigns the intervention, given that not all can be covered. For example, if one is evaluating a training program or a program that requires skills for maximum impact one would reasonably assume (backed up by some evidence) that prior education and/or experience will enhance impact and design the evaluation accordingly. This has ethical advantages over simple randomization when there are priors about likely impacts. But there is a catch. The set of things observable to the evaluator is typically only a subset of what is observable on the ground (such information asymmetry is, after all, the reason for randomizing in the first place). At local level, there will typically be more information—revealing that the program is being assigned to some who do not need it, and withheld from some who do. The RCT may be ethically unacceptable at (say) village level. But then whose information should decide the matter? It may be seen as quite lame for the evaluator to plead, “I did not know” when others do in fact know very well who is in need and who is not. Goldberg reminds us of another defense often heard, namely that RCTs can use what are called “encouragement designs.” The idea here is that nobody is prevented accessing the primary service of interest (such as schooling) but the experiment instead randomizes access to some form of incentive or information. This may help relieve ethical concerns for some observers, but it clearly does not remove them—it merely displaces them from the primary service of interest to a secondary space. Ethical validity still looms as a concern when any “encouragement” is being deliberately withheld from some people who would benefit and given to some who would not. While ethical validity is a legitimate concern in its own right, it also holds implications for other aspects of evaluation validity. There is heterogeneity in the ethical acceptability of RCTs. That will vary from one setting to another. One can get away with an RCT more easily with NGOs than governments, and with small interventions, preferably in out-of-the-way places. (By contrast, imagine a government trying to justify why some of its under-served rural citizens were randomly chosen to not get new roads or grid connections on the grounds that this will allow it to figure out the benefits to those that do get them.) An exclusive reliance on randomization for identifying impacts will likely create a bias in our knowledge in favor of the settings and types of interventions for which randomization is feasible; we will know nothing about a wide range of development interventions for which randomization is not an option. (I discuss this bias for inferences about development impact further in “Should the Randomistas Rule?”.) Given that evaluations are supposed to fill our knowledge gaps, this must be a concern even for those who think that consequences trump concerns about processes. If evaluators take ethical validity seriously there will be implications for RCTs. Some RCTs may have to be ruled out as simply unacceptable. For example, I surely cannot be the only person who is troubled on ethical grounds by the (innovative) study done in Delhi India by Marianne Bertrand et al. that randomized an encouragement to obtain a driver’s license quickly, on the explicit presumption that this would entail the payment of a bribe to obtain a license without knowing how to drive. (This study was conducted and funded by the World Bank’s International Finance Corporation. And it was published in a prestigious economics journal.) The study confirmed that the process of testing and licensing was not working well even for the control group. But the RCT put even more drivers on Delhi roads who did not know how to drive, adding to the risk of accidents. The gain from doing so was a clean verification of the claim that corruption is possible in India and has real effects, though I was not aware of any prior doubt about the truth of that claim. The experiment might not then be as clean as in the classic RCT—the prized internal validity of the RCT in large samples may be compromised. But if that is always judged to be too high a price then the evaluator is probably not taking ethical validity seriously. The growth rate in the mean for the poorest 40% has the appeal of simplicity. But that comes with a cost. An important concern is that it does not tell us anything at all about how much rising prosperity is being shared amongst the poorest 40%, or how the losses from economic contraction are being spread. For example, the mean of the poorest 40% could rise without any gain to the poorest. That limitation is important in the light of recent research. While the developing world as a whole has made huge progress in reducing the numbers of people living in poverty, much less progress has been made in raising the developing world’s consumption floor—the level of living of the poorest. (I show this here.) If we are really committed to sharing prosperity then we should surely not be leaving the poorest behind. Let’s take a simple example. Suppose that there are four representative people comprising the poorest 40%, with incomes (in $s per day) of $0.75, $0.75, $1 and $1. After some economic shock or policy change their incomes are $0.50, $0.75, $1 and $1.25, i.e., there is a gain of $0.25 for the least poor, at the expense of the poorest. The growth rate in the mean of the poorest 40% is zero, while their mean growth rate is -2% (the average of -33%, 0%, 0%, 25%). This change may still not be considered enough. There are other measures, although they often lose the advantage of simplicity. In more careful monitoring, a broader dashboard of measures will clearly be needed in assessing how well prosperity is being shared. For example, if one really cares about not leaving the poorest behind then one should also focus directly on that; there are now operational measures for that purpose, which are also easy to implement, as I show in this paper. However, my point here is that one can improve the Bank’s measure with only a small change in wording. And the alternative measure can be implemented at virtually no extra cost in monitoring. In an OPED last year, “Reading Piketty in India,” I noted how poor the U.S. was in the mid-19th century. As best I can determine from the data available, the proportion of America’s population living below India’s poverty line was roughly as high then as it is in India today. 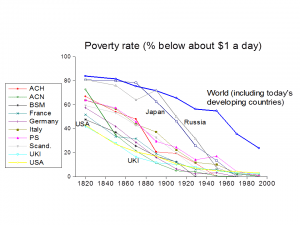 The period 1850-1929 saw the poverty rate fall by some 20 percentage points. The U.S. saw great progress against extreme poverty in this period. A few people have asked me for more details. Here they are, also extending the calculations to other rich countries. Francois Bourguignon and Christian Morrisson assembled distributional data back to the early 19th century, to match up with Angus Maddison’s estimates of national income. 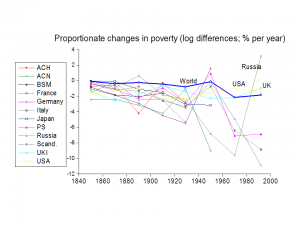 Bourguignon and Morrisson only calculated poverty measures for the world as a whole. 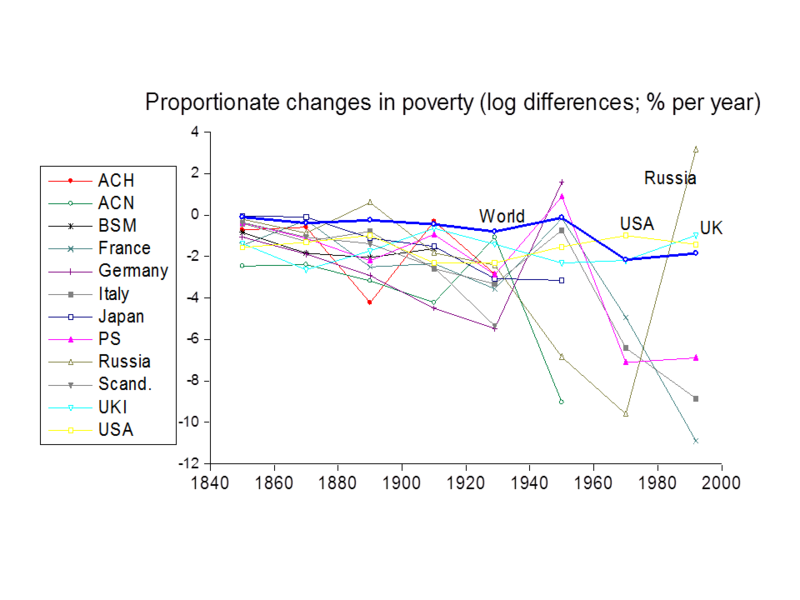 Using their data base (which they kindly provided) I calculated what % of the population of the countries in their study that are considered rich countries today lived below the Bourguignon-Morrisson “extreme poverty” line back to 1820. That line was chosen to synchronize with the poverty rate for 1990 implied by the Chen-Ravallion “$1 a day” line. Figure 1 summarizes the results. Time for the BIG Idea in the Developing World? The challenges of measuring and monitoring global poverty have received a lot of attention in recent times. There have been debates about the Sustainable Development Goals, as well as some more technical debates. Assessments of progress against poverty at the country level, and most decisions about how best to fight poverty within countries, do not require global poverty measures. Nonetheless, such measures are important to public knowledge about the world as a whole, and they help inform the work of development agencies, including in setting targets for overall progress. In a new working paper I discuss three current issues that are specific to global poverty monitoring, and proposes some solutions. The first relates to one of the main sources of dissatisfaction with prevailing poverty measures that use a constant real line, namely that they do not take account of the concerns people everywhere face about relative deprivation, shame and social exclusion; these can be termed social effects on welfare. To some extent the fact that higher national lines are found in richer countries reflects these social effects on welfare. But the differences in national lines also reflect to some extent more generous welfare standards for defining poverty in richer countries. Yet we can all agree that we need to use a consistent welfare standard in measuring poverty globally. We need to be reasonably confident that people we judge to have the same level of welfare—the same capabilities for example—are being treated the same way wherever they live. Amartya Sen put the point nicely: that “…an absolute approach in the space of capabilities translates into a relative approach in the space of commodities.” But when we think about how best to do that, we run into the problem that we do not know whether the higher lines in richer countries reflect differences in the incomes needed to attain the same level of welfare, or (instead) that they reflect higher welfare standards in richer countries. The paper argues that two global poverty lines are needed—a familiar lower line with fixed purchasing power across countries and a new upper line given by the poverty line that one would expect given the country’s level of average income, based on how national poverty lines vary across countries. The true welfare-consistent absolute line lies somewhere between the two bounds. By this approach, to be judged “not poor” one needs to be neither absolutely poor (independently of where and when one lives) nor relatively poor (depending on where and when one lives). The second problem is an evident disconnect between how poverty is measured in practice and the emphasis given in social policy and moral philosophy to leaving none behind. For example, a 2013 report initiated by the U.N. on setting the new SDGs argued that: “The indicators that track them should be disaggregated to ensure no one is left behind and targets should only be considered ‘achieved’ if they are met for all relevant income and social groups.” But how do we know of none are being left behind? To assess whether the poorest are being left behind one needs a measure of the consumption floor. Here there is a severe data constraint, namely that a low observed consumption or income in a survey could be purely transient, and so unrepresentative of permanent consumption. However, I have shown that a more reliable estimate of the consumption floor can be derived from existing measures of poverty under certain assumptions. This can be readily implemented from existing poverty data, and it provides a rather different vantage point on progress against poverty. While the developing world has made much progress in reducing the number of poor, there has been very little progress in raising the consumption floor above its biological level. In that sense, the poorest have been left behind. Progress against poverty should not be judged solely by the level of the consumption floor, but it should not be ignored. Finally, the paper reviews the ongoing concerns about the current Purchasing Power Parity (PPP) exchange rates from the International Comparison Program (ICP). (See, for example, the CGD blog post here, and the comments on that post; my new paper addresses this debate.) The days are (thankfully) gone when the community of users simply accepts without question the aggregate statistics produced by publicly-funded statistical organizations like the ICP. Recurrent debates about the ICP’s results have been fueled in part by poorly-understood methodological changes and in part by the ICP’s longstanding lack of openness, notably in access to primary data. Calculating PPPs that are appropriate for global poverty measurement using ICP price data is not exactly easy, but nor is it the hardest task imaginable as long as researchers have access to the data. There are also options to using ICP prices, although further testing is needed on their performance. Even staying with the ICP, adjustments will be called for, such as to deal with urban bias in the price surveys. Going forward, better price-level comparisons for the purpose of measuring poverty, including sub-national analysis, require re-estimating the PPPs from the primary data. If the ICP is to continue to be a valuable resource, it needs to make public the primary data to facilitate such calculations. Each of the paper’s proposals for addressing these problems could undoubtedly be improved upon and refined if there is enough agreement that effort is needed to develop better global poverty measures along these lines. That effort is justified if our global measures are to continue to have relevance in global public knowledge, and to international policy making and poverty monitoring. This week saw the release of the World Bank’s updated global poverty counts. There is new country-level data on poverty and inequality underlying these revisions. But the big change is that the numbers are now anchored to the 2011 Purchasing Power Parity (PPP) rates for consumption from the International Comparisons Program (ICP). Previously the numbers were based on the prior ICP round for 2005. The Bank published a reasonably clear Press Release explaining that the new international poverty line is $1.90 per person per day at 2011 prices; also see this blog post by Bank researchers. The FT article went further to suggest why this has happened, quoting Angus Deaton, a Professor at Princeton, as claiming that the Bank has an “institutional bias towards finding more poverty rather than less.” By this view, there is a motive to the Bank’s seemingly large upward revision to its poverty line—to keep itself in business as the leading institution fighting global poverty. But this conspiracy theory makes little sense on closer inspection. We must first understand that the $1.90 is in 2011 prices while $1.25 was in 2005 prices. Everyone knows about inflation. But how should one deal with inflation for this purpose? If one simply updates the $1.25 line for inflation in the U.S. one gets $1.44 a day in 2011. This was done in some calculations soon after the release of the 2011 ICP results, such as those by CGD researchers reported here. Updating the line for U.S. inflation 2005-11 greatly reduces the global poverty rate for 2011 when compared to the old PPPs. However, fixing the U.S. purchasing power of the international line over time is very hard to defend given the generally higher inflation rates in developing countries than the U.S. Thus, while $1.44 a day in 2011 has the same purchasing power in the US as $1.25 in 2005, when $1.44 is expressed in local currencies of developing countries using the 2011 PPPs it has lower purchasing power in most of those countries than when the prior $1.25 line in local currency is adjusted for inflation in those countries. In that sense, using $1.44 in 2011 lowers the poverty line, and that is why one gets less poverty. Instead, the Bank’s researchers went back to the national poverty lines for low-income countries that were used to derive the $1.25 a day line, as described here. They then updated those national lines to 2011 prices using the best available country-specific Consumer Price Indices. On then converting to PPP for 2011 and taking an average they got $1.90. This is not the only way one could have updated the $1.25 a day line. One could instead have asked what the average national line is amongst the poorest “x” countries in 2011, which would have been more consistent with past methods used by the Bank. But the method they have used to get to $1.90 is defensible, and it has the appeal that the underlying national lines for low-income countries have constant purchasing power over time. This is surely a strange way for the Bank to reflect the claimed bias toward overstating the extent of poverty. More plausibly, in my view, there is no such bias since the real value of the line is being held constant in poor countries. 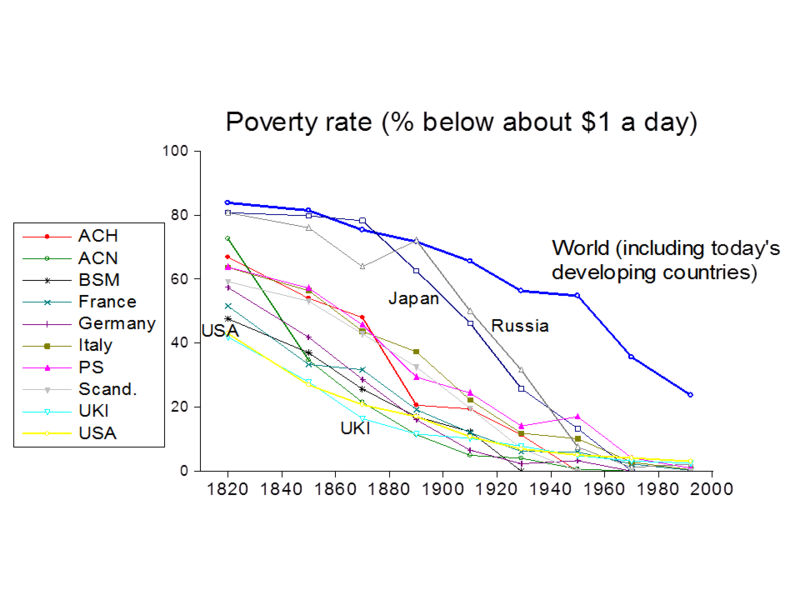 Furthermore, none of this makes much difference to the pace of progress against extreme absolute poverty over time. As the Bank announced in its Press Release, that progress remains largely unchanged from the old PPPs. Indeed, the PR is quite upbeat on the pace of progress. This hardly sounds like a bias toward exaggerating the extent of global poverty! There are, nonetheless, changes in the composition of the world’s poor, as the new ICP round has revised the PPPs for many countries. Those changes are not yet well understood. (See, for example, my comments here on India’s new PPP.) As I noted in a recent blog post, “We need better global poverty measures,” the ICP has not been as open as one would like about their price data. And the raw PPPs are not well suited to poverty measurement. The Bank’s researchers have done some “patch-ups” (such as adjusting for the evident urban bias in the ICP’s price surveys), but a more fundamental ICP overhaul is needed if the PPPs are to continue to be used in global poverty measurement. I also argued in the same blog post that the absolute line of $1.25 a day in 2005 prices (or $1.90 a day in 2011 prices) is inadequate today. Two global poverty lines are now needed—a lower line with fixed purchasing power across countries and a new upper line given by the poverty line that one would expect given the country’s level of average income, based on how national poverty lines vary across countries. The true welfare-consistent absolute line—whereby one judges poverty by a common absolute standard of welfare, which may well require differing commodities in different settings—lies somewhere between the two bounds. By this approach, to be judged “not poor” one needs to be neither absolutely poor (independently of where and when one lives) nor relatively poor (depending on where and when one lives). Global poverty estimates for both bounds can be found here; the upper bound suggests less progress against poverty, but still progress. If anything, the World Bank is overestimating the pace of that progress. My advocacy of this new “upper bound” is not some bias toward over-estimating poverty for some conspiratorial reason. Rather it recognizes the differing social realities of what is needed to not be considered poor in today’s world. The World Bank, and its critics, also needs to recognize those realities.